Actually, whether they are consciously aware of it or not, students do benefit from seeing you at least some of the time. A clear sense of a teacher’s presence in a course is critical, especially in online environments where students can’t interact in person with their instructor and classmates. This presence, sometimes referred to as “social presence” or “instructor presence,” has been shown to play a significant role in priming students for the deeper forms of cognitive processing that are essential for learning. This is partly due to several cognitive principles that affect how subtle social cues–like as eye contact, facial expression, and physical gestures–prompt us to exert extra effort to learn and to make sense of new information (Mayer 2014). 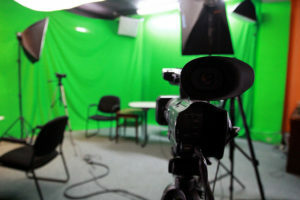 To be sure, some of these cues can be provided in other ways, such as conscious modulation of diction or tone, but your occasional visible presence in videos is one of the most effective things you can do to establish rapport with your students and to help motivate learning in online and hybrid courses. Course videos don’t have to be major productions–but they do benefit from an intentional approach in which your presence inspires and motivates learning. Does this mean that you must always appear in course videos? Not at all. In fact, there are plenty of times when appearing on screen may distract from the learning you’re trying to facilitate. Solving a complex math problem, demonstrating a series of actions in a software application, or highlighting code are all cases where students are likely to learn best when they can focus exclusively on the problem or activity you’re showing them. (For the curious, that’s because reducing extraneous cognitive processing is one of the most effective ways to increase the amount of attention devoted to the most essential information. So looking at your teacher’s face while you’re trying to concentrate fully on a difficult problem can actually be counterproductive.) But when you’re introducing a new concept or activity, contextualizing it, or connecting it to other knowledge students may already have you’ll often get better results when you seem to speak directly to your students by appearing in the video. But there’s no reason I have be present in videos, is there? Can’t I just used the videos that Professor Smarty posted on YouTube for his class, or the ones provided by the publisher of the course textbook? There’s nothing wrong with repurposing existing public videos made by others if you think they are relevant to your course. In fact, this can often be a good way to introduce new perspectives, approaches, and expertise in specialized topics–just as you might do by inviting guest speakers to your class from time to time. But there is a big difference between using videos created by others as occasional supplements and relying exclusively on them for teaching. After all, you probably wouldn’t choose to teach an in-person class by refusing to appear in the classroom, and then sending in your place an entire quarter’s worth of colleagues and guest speakers! More to the point, students also want to hear from you, to learn from you, and to get to know you–and also to know that you care about establishing meaningful connections with them. Videos aren’t solely about delivering information. Yes, they do that, but they are also valuable opportunities to do much more, opportunities to stimulate discussion and curiosity, to inspire, to encourage and mentor, and to begin to connect with your students even when you’re not together in the same room. (If transmitting information is the only goal, there are probably far cheaper and more efficient ways to accomplish it–like replacing teachers with robots. I fervently hope that’s not going to happen any time soon!) You may have heard my colleague Peg Balachowski talk (and write) about the Four Connections, four evidence-based principles that emphasize the importance of student-faculty connections for long-term student success. The available evidence shows clearly that most students want to establish meaningful relationships with their teachers, and that they benefit greatly when they are able to do so. Seeing their instructor appear to speak directly to them, even if it’s just in a few short videos, can have a profound and lasting impact on students’ motivation to learn. You’ve persuaded me to reconsider some of my initial ideas about course videos. What should I do as I start planning new videos? As with any aspect of planning and developing a course, there are countless possibilities available to you. One way to begin deciding which options to pursue is to consult with an instructional designer — like EvCC’s very own Derek Jorgenson. Instructional designers like Derek can help you ask and answer questions about what you hope to accomplish with your course videos, then work collaboratively with you to determine which approaches are most likely to help you achieve those goals. Brame, C. J. (2015). Effective educational videos. Retrieved 9/25/2017 from http://cft.vanderbilt.edu/guides-sub-pages/effective-educational-videos/. Mayer, R. E. (2014). Research-based principles for designing multimedia instruction. In V. A. Benassi, C. E. Overson, & C. M. Hakala (Eds.) Applying Science of Learning in Education: Infusing Psychological Science into the Curriculum.